We have all seen the commercial now, right? Well, if you haven't seen the commercial, someone on your Facebook has posted. 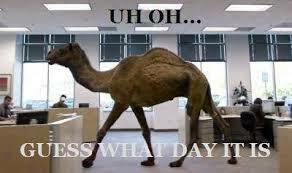 Every Wednesday - its the Camel bringing forth good tidings of Hump Day! So, today's dress was a simple but goodie no pattern required dress. Upcycling is a GREAT way to re-use clothes and save money on fabric. Today's dress takes a JoAnns plain t-shirt that was 3 for $9 and is a youth medium 10/12. I cut it 2 inches below the underarm and then added the skirt. The skirt is 6 panels of half a fat quarter. You can measure the width of the cut off area and just multiply that by 1.5 or 2 to determine how much fabric you need to make a gathered skirt. Once I sewed the skirt panels together, I added a ruffle at the bottom - again, no rocket science, just figure out how long you need it to be. 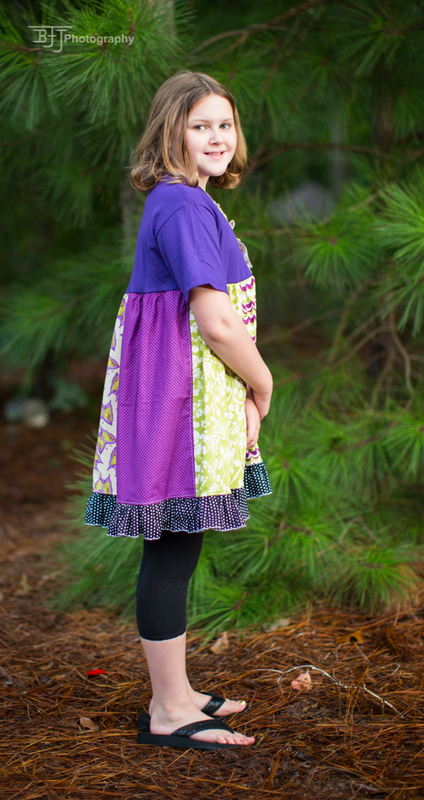 This dress ended up being a empire style with a full gathered skirt. On the shirt, I gathered 2x the length of the center of the tshirt to make a ruffle and the ruffle was 2.5" wide. I rolled hemmed both long edges to prevent fraying. Then I put a strip of ribbon down the stitch line of the ruffle and stitched 4 buttons on. You can do so much with this and it looks great. She got three compliments after I picked her up from school today. A lot of high end designers have this type of dress style and they are charging $50+ for it. 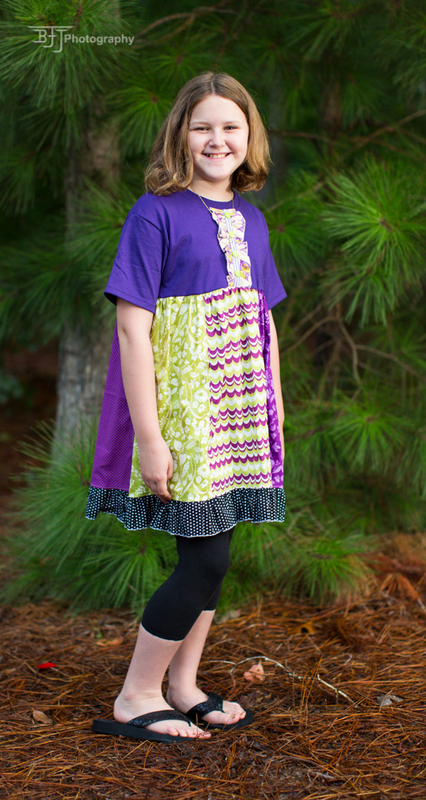 I may draft a tutorial for the weekend edition to show you how to make your tween (or younger child or YOU) a similar dress. 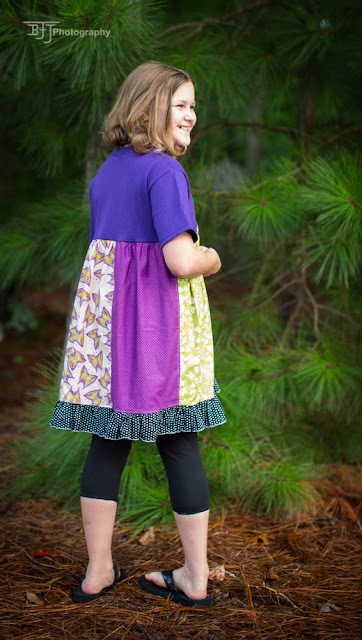 Oh and another tip for this style of dress, either when you are serging the raw edges after sewing together the skirt and shirt or after, stitch clear elastic (found in the notions section of your local sewing supply stores - JoAnn, Hobby Lobby, Hancock) on the bottom side of the seam. It will help hold the shape. I actually feed it in while I am serging keeping it taut/lightly stretched. Supah cute, Supah easy - Never hurts to have those go to patterns you can whip up quickly but still look cute. Tomorrow, I am in LOVE with the dress (little hint there!) So, be sure to check back in!! PS - We didn't have cross country practice today so I didnt run, but I am back on the trail with her tomorrow for 2 miles. Wish me luck and no scratched. PPS - If you are of the praying kind, please say a prayer for one of the 8th graders at our school. His dad passed away unexpectedly last night. That has been weighing on my heart because he is only a year older than my son and his dad was very young.